Quizzes for building a solid foundation for knowing who you are. 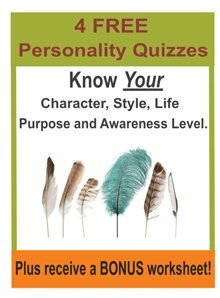 These free character, style, purpose and consciousness level quizzes will help you know yourself better. To the degree that you know yourself, only to that degree can you heal and grow yourself. If you are starting a journey you must first know where you are at. These personality quizzes and tests will help you build a solid base for your life journey. Explore your blocks and potentials in life, your unique approach to life and what needs healing or expansion. Take this personality style test and know your natural, easy way of doing life. Gain insights into your heart's desire and who you are meant to be. To the degree you are aware, you create your life. How aware are you?